Four years ago today, our friends at No Night Flights held their first public meeting at Chatham House School. The hall seated 500. The seats were taken and people still kept coming in. They had to stand. That kind of puts into perspective, doesn’t it, the pitiful response that SMA and SuMA have had for every clarion call that has gone out from plane lovers’ HQ to get people to a meeting? At most we have seen a few dozen old faithfuls turn up, and typically it is less than that. In contrast, there were 500+ for the first NNF meeting – remember that, Sir Roger Gale? Remember that, Cllr Bayford? Various local politicians came along to listen to the debate. The room was full of local residents. Don’t forget – this was before Facebook became a vehicle for campaign groups artificially to inflate their numbers with imaginary friends from around the globe. These were real people in that room, local people who were affected by the airport. People came because they had seen posters on nearby trees and/or because they had had a leaflet stuffed through their letterbox. If you weren’t from Thanet, you would not have known that the meeting was happening. This was not some virtual collection of people from all over the UK and from global pilots’ forums. This was not a bunch of people who were only involved because they had been misled into fearing mass housing. These were actual, flesh and blood, local voters and residents who were affected by the airport. Feeling was strong and people were overwhelmingly, emphatically against night flights. Some airport fans who had come along for the ride went very quiet as it became clear that they were in the minority as many, many people were also against the airport itself. Policy was changed on that night. The Conservative MP for South Thanet, Laura Sandys, sent her representative who told the room that Ms Sandys was against night flights. TDC’s Labour Group came out against night flights following that meeting. 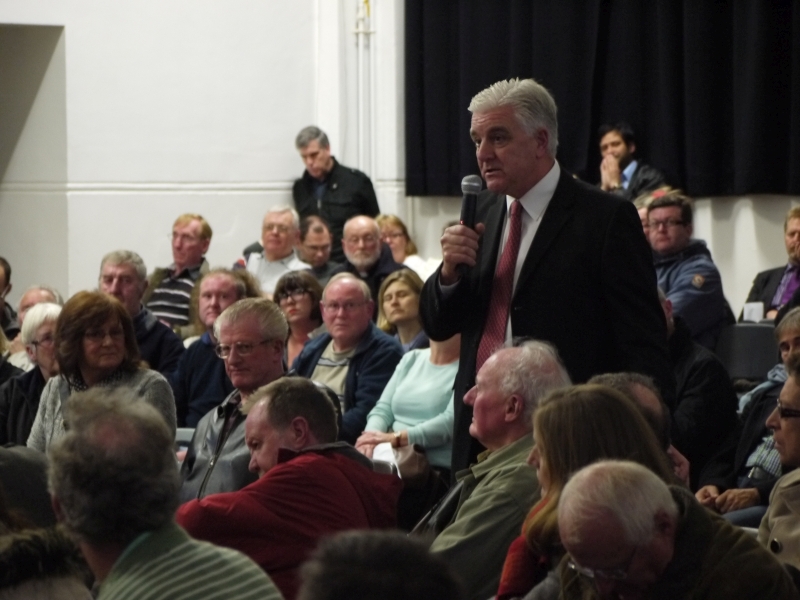 It was a startling demonstration of how angry local people were that local politicians were cosying up to Infratil to support a failing airport by approving night flights. And now we have Sir Roger Gale, more interested in supporting RiverOak than he is in listening to his constituents, working with a bunch of people who live nowhere near the airport, desperate to inflict on us all a noisy, polluting cargo airport whilst making sure that he does everything he can to prevent development taking place that could create thousands of jobs. Memories are short, aren’t they, when it comes to taking account of what local residents really want? Now that the CPO is dead, we look forward to seeing Stone Hill Park develop into a catalyst for positive economic and social change for Thanet… in spite of the actions of its Conservative Member of Parliament. What’s the matter, Rodge? Thirty years of growing deprivation for Thanet not enough of a legacy for you at the end of your MP tenure? Are you really determined to chase off the biggest chance that Thanet has ever had to bring about positive change? If you don’t fancy representing those of us who want a new future, do you fancy shoving over and letting someone who does care about the current and future generations of local residents take over? You could then retire back to your nice quiet little Kentish village a long way away and let us get on with building a better future for this much neglected area. Give it some thought, eh? Yes indeed it is time to chop down Rogeroak and confine him to the bin where he belongs. Forget CPO’s let the rightful owners get on with their development plans. That’s where the jobs lie and income for TDC also.